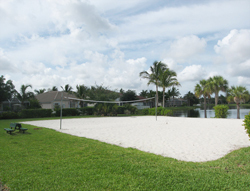 Reflection Lakes Fort Myers is a gated community in South Ft Myers consisting of 820 properties, 194 of which are single family homes and 358 are villa homes, and 268 condos. Reflection Lakes is centrally located off Summerlin Rd and Cypress Lake Dr with entrances from both. Perhaps Reflection Lakes greatest beauty is the fact that it abuts Lakes Regional Park full of pristine views and wildlife. Reflection Lakes residents even have their own private entrance into Lakes Park. Home prices are down significantly from their highs back in 2005, as all neighborhoods are. Currently there are homes priced from $145,000 to $629,700 on the market. The highest sales price for a home in 2011 has been $510,000. Condos on the market currently range from $119,900 to $219,000. The highest condo sales price in 2011 was $185,000. The home pictured above is currently listed by the Ellis Team for $280,000 and is located in the Las Palmas section of Reflection Lakes, formerly known as the Estates II section. The home has 4 bedrooms, 3 baths and has 2433 square feet of living area. The kitchen features granite counter tops, and the home has a large private back yard with lake views. The home also has hurricane shutters. Another amenity residents love is the clubhouse. 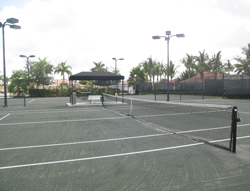 Reflection Lakes offers clay tennis courts, a bocce court, a full sized basketball court, volleyball court, putting green, and an oversized pool with waterfall along with a children’s pool. 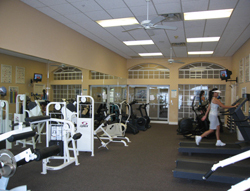 Inside the clubhouse is an exercise room with state of the art professional workout equipment, a card room, billiard room, and a banquet room with full kitchen. 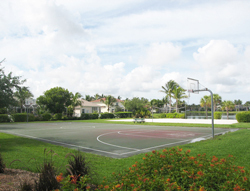 The community enjoys many community events as the residents have an active recreation committee planning wonderful events year round. Reflection Lakes is very stable financially which makes it attractive for buyers and lenders. Lenders today are skittish about lending when there are many homes in foreclosure or a certain number are unoccupied investor units. 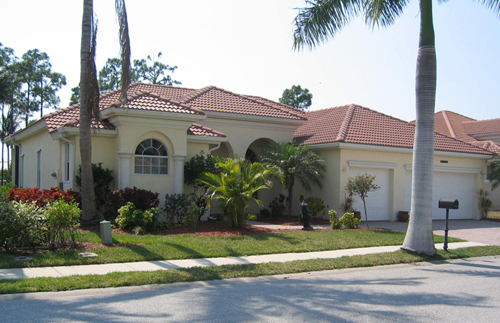 Reflection Lakes is primarily owner occupied or seasonal residents which makes getting a mortgage easier for borrowers. Fees are low and cable TV is included. Lawn mowing is included in the Villa homes and of course all condos. We enjoy bringing you market stats and timely real estate information that impacts the market each week. To shake it up a bit, we thought every once in awhile it would be nice to update you on what’s happening in a specific community. Stay tuned and one day you just might see your community featured here. Official sales numbers were released today and median home prices were up 19% over last year, rising from $96,900 in May 2010 to $114,900 May 2011. 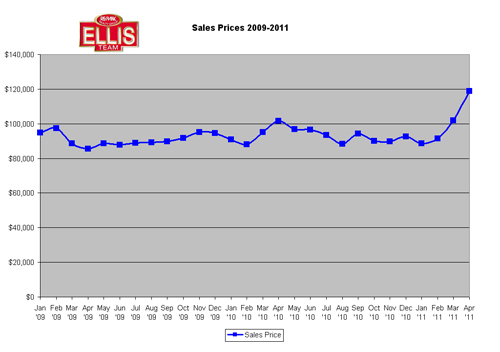 Prices were down from April 2011 level of $118,900. Transaction volume fell slightly too, down 8% from last year. This is not surprising as inventory levels are down sharply from year ago levels. 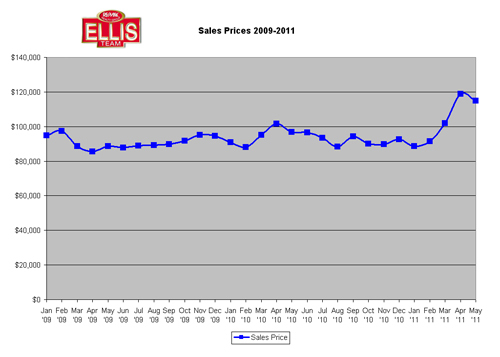 We have been predicting all year prices would rise, which they have from $88,500 in January 2011. These prices increase are due to lower inventory, and lower priced properties at the bottom end of the spectrum. Median home sale prices are up 29.83% since January, but this doesn’t mean all homes have gone up nearly 30%. It simply means there are fewer homes available at the bottom end of the spectrum. All through the foreclosure height it was not uncommon to find many $30,000-$50,000 homes in Lehigh acres, and a few in Cape Coral. Last year it became harder to find homes under $70,000 and this year it’s become difficult to find homes under the $90,000-$100,000 mark. 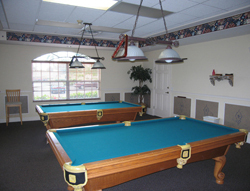 When they do become available they are snatched up immediately, or they have significant repairs pending. A typical $200,000 home, depending on where it is located, may have risen or fallen slightly; however we haven’t seen 30% price swings as the market has stabilized in many sub markets. These price increases are more a function of the definition of media, which is defined as half the sales under and half the sales over a given point. When the lower end disappears it doesn’t necessarily mean there is rise in the moderate to upward end, although it is also possible. We feel this market will lead from the bottom up. We refer to it as the “Bunching Effect”, a term we came up with several years ago to describe how the real estate market works. The real estate market is not as efficient as the stock market where everyone can look up on the Big Board and see what the value is at any given second. In real estate, market reactions take time, and they don’t always move in unison. One segment may move, and when the market figures out there should be more separation between two segments, another segment will move. Two segments can become too “Bunched” together, and when the market realizes this, it reacts. It is not always done in real time second by second, but it does react just the same. Buyers look at what they can buy at any given time and they make decisions. For instance, they may be looking in the $150,000 price range and see one home for $145,000 and a much nicer home in same neighborhood for $150,000. In their mind there should be more than a $5,000 difference, so either the $145,000 needs to come down or the $150,000 should be priced higher. There could be multiple offers on the $150,000 home and it may indeed go higher if enough buyers come to same conclusion at same time. If not, the next few homes that come on the market may figure it out. In any event, something has to give. This leads to upward pricing pressure on one or downward pricing pressure on the other until the market finds equilibrium, and so the process repeats itself day after day. Our job is to watch the market and not focus on any one given sale, but look for trends in the cycle which would indicate movement. Markets can become “Bunched” and they can “Unbunch” This is a natural phenomenon and buyers and sellers can sometimes get too caught up in one sale or one listing on the market and rely on that data as a market trend, when in fact it may just be a single event. We also need to keep in mind that anyone can list a property for any price. The seller determines the price, but the market determines the value, so be careful not to get caught up on what the neighbor down the street listed one house for. The market will always speak to you if you’re willing to listen. Under pricing costs a seller equity, and over pricing insures property will sit and may take a lesser price down the road when the listing grows stale. Proper pricing is just as critical to a seller as proper offers are for a buyer. Failure on either end of the spectrum leads to disaster. An over priced home helps sell the competition, and a low ball offer helps another buyer purchase your 1st choice. The real question is, do you want to buy, or do you want to sell. And the answer is, objectively determine what the market really is and go from there. Happy house hunting or house selling, and don’t be afraid to ask for help. The market is on the move, and figuring out your next move is half the fun. Official median prices are up 35% from January and it’s no wonder when inventory levels are falling so dramatically. 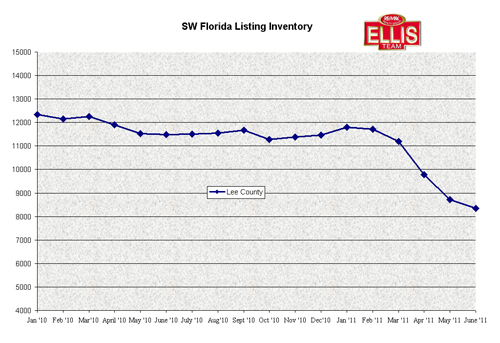 The Ellis Team SW Florida Current Market Index now stands at 3.04 which is at its lowest level since September 2005 when it stood at 2.11 but was on the rise. The Current Market Index accurately predicts future direction of the market and has been so successful the National Association of Realtors has adopted its own Pending Home Sales Index. The difference is our index measures more than just pending sales which is why it’s been a leading indicator of where the market is headed. Back in 2005 we were able to predict a market swing when most everyone else felt the SW Florida real estate market was a runaway train that couldn’t be stopped. We all learned a valuable lesson from that and realize anything can be stopped. This same indicator has been trending down since September 2010 when it stood at 5.0. The lower the number the hotter the market is. Another way to put it, the higher numbers signifies a buyers market and lower numbers signify a sellers market. Now sellers can’t be too comfortable as it doesn’t mean prices can rise automatically as a number of factors have been in play which we’ve documented at length in past articles. Buyers have been nervous for months as well as they’re quickly realizing they’ve missed the bottom of the market and are frantically trying to get in before prices rise too much more. The largest mistake we see buyers making today is making offers based upon sales back in January when prices were lower. We’ve always said you’ll never really know when the bottom is until after you’ve passed it. Buyers realize we’ve passed it, but they’re trying to go back and negotiate back to those bottom prices and it’s not working. Each time they fail there is less inventory to choose from and they begin the cycle all over again. Education is so important in any market. Both buyers and sellers have to be educated to what’s happening today in real time. So often we see buyers and sellers using old data to influence their positions and desires in the market, and old data can let you down and cause you to miss out, or overpay or overprice depending on whether you’re a buyer or seller. A seller never wants to overprice in a declining market just as a buyer never wants to lowball in a rising market. In each case they customer ends up chasing the market in the wrong direction, and when they figure out their mistake it costs them in the pocketbook. A stock investor cannot count on buying a stock at the same price as it was last month or even last hour as the market changes. The only beauty of the stock market is its liquid and you only need to look at the Big Board or online to see the stock’s current value in real time. Real estate isn’t quite that simple as there is no Big Board or stock exchange to look at, but the principles are the same. Supply, demand, location, amenities, financing, jobs, and the economy all influence the market. Educating yourself to what’s going on today can save you mistakes. It’s been proven that sellers who overprice end up taking less when it’s all said and done than the seller who prices correctly upfront. The greedy seller loses market momentum as the listing is best seen when it’s fresh and new to the market. After awhile it becomes stale and people wonder what’s wrong with it, and then the lowball offers begin, if there are any offers at all. The wise seller recognizes the market and lists accordingly. The same can be true with the wise buyer. They say the early bird gets the worm. In this case, it’s not always the first offer that gets the prize; it’s the best crafted and educated offer that wins. Wisdom begins with educating yourself on current market conditions and we hope these stats help you in your decisions whether you’re buying or selling. When you see changes in the marketplace sometimes it’s helpful to put the data into historical perspective to see what trends may be developing if any, and what it all means. In order to do this, you must first have data from the past. Fortunately, we track all this data monthly and have for years, so it’s easier to go back and evaluate and identify trends. 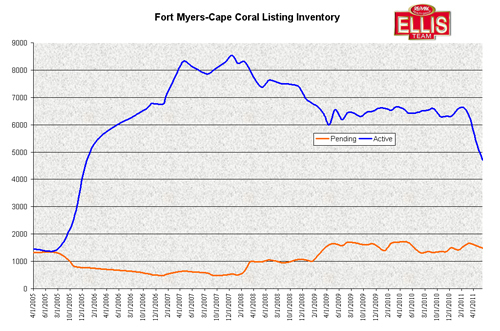 Listing inventory in just Fort Myers and Cape Coral is about the same as it was on January 2006 when it was headed up. Back then pending sales were trending lower and listing inventory was just about to explode as the height of the market was really about 3rd quarter of 2005. We still had some residual closings that took place up until December 2005 and into January 2006, but market activity really started dropping off in 2005. Very few people realized it at the time as many were still busy and not watching the numbers. Pending sales are actually higher right now then they were back then, although they’ve been trending down just a bit as inventory has fallen off. Increasingly buyers are having a more difficult time scooping up the best buys because inventory has been falling and prices have been rising. We’ve seen an influx of buyers wanting to get in on the bottom of the market, and many are coming to the sad conclusion that they missed the bottom. Many experts have been educating buyers that they will always miss the bottom because you won’t really know it’s the bottom until you see it in the rear view mirror. Only then do buyers believe it. At the actual bottom buyers are greedy and either hope or expect the market will go lower, so they resist buying out of fear. When they realize they’ve missed the bottom, the react out of fear of missing out on a rising market. It’s a simple yet basic human emotion called greed, and greed shouldn’t be considered a bad thing unless it dampens your ability to evaluate what reality is. Sellers tend to read headlines that prices are on the upswing and they also get greedy hoping for prices back in the heyday. We’re not going back to heyday prices, nor should we. Prices were artificially too high back then, just as they’re artificially too low right now. A market could not sustain those prices back in 2005 because incomes were not in line with the cost of ownership. Today prices are too low because sale prices are so far below the cost of construction. This is why we see very few building permits being pulled. These low prices cannot last forever and will rise in time. The question is how fast, and how high can they go. 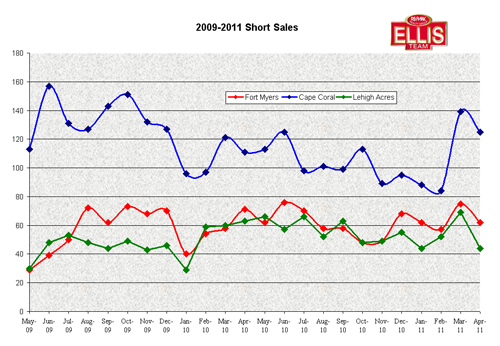 We’ve already seen the beginning as median prices have risen over 35% since January in Lee County. Nobody knows from here on out how much higher they’ll go or how fast as it really depends on future bank owned inventory entering the market, jobs, interest rates, and the overall economy. All these factors influence the economy and the housing market. What we can do is continue to provide graphs and show you what is happening in real time. Armed with this information, and adding it to what you already know about the wildcards influencing our economy, you can pretty much draw your own conclusions and you might be about as right as the so-called experts. It all begins with accurate information, and from there the analysis is fun. Too often salespeople have an agenda, as in they’d like you to buy something or do something, so they report a distorted view, or at least a view of what they think is going on without real facts to back up their theory. It’s been a tough 5 years for anyone in the real estate industry including agents, brokers, mortgage brokers, title companies, attorneys, surveyors, builders, appraisers, etc. I’ve found that even in an up, down, or sideways market there is always a need for quality people in any profession, so you might as well present the facts and let the market decide on the pace and trajectory. The market wins out every time and we all have to play within the confines of the market. When anyone thinks they’re bigger than or an exception to the market, the market has a way of explaining things. Buyers, sellers, agents, banks, etc. have all learned this lesson, so let’s not let history repeat itself, and when it does hopefully it will repeat on someone else. We’ll keep providing the data we’re looking at, and good luck accomplishing your goals in this market. As you can see from the graph, short sales have been on the uptick over the past two year period as lenders have geared up to handle more short sales. It is proven that banks lose less on short sales as the property tends to stay in better condition throughout the process, and the banks spends much less on attorney’s fees and vacancy on short sales than foreclosures. As you may recall, the government came out with programs like HAMP and HAFA as well as others, but none have been largely effective at curtailing foreclosures. You might ask yourself when has the government ever setup a big program that worked as the politicians said it would. These programs were also mostly voluntary. Some of the banks have realized that selling a home as a short sale is in their best interests, and some must have decided it’s not. We wonder if perhaps banks don’t want to show losses on their balance sheet today, so they’d rather wait and take a bigger loss tomorrow on a foreclosure because the income statement can better handle it in the future. Perhaps the answer to that theory is best answered on a case by case basis. Some banks have invested significant resources to address short sales. Bank of America for example has trained certain agents and put their entire short sales system online similar to how we work their foreclosure system. The beauty of an online system is that everyone involved can look at the file and upload their piece of information so the bank can make quicker decisions. We’re finding this system works miracles over previous antiquated fax and wait systems, only to find out the bank lost the fax. Now there is accountability and tracking. Chase is another example of a large bank we’ve had good success with lately. Besides Bank of America, Wells Fargo, ASC, BSI Financial Services, and Nationstar Mortgage have also gone to the online system known as Equator for their processing of short sales. We expect to see significant improvements in the communication, processing, and closing times of the banks that have gone to online processing. Banks such as Ocwen, SunTrust, and many others have been particularly difficult to deal with and take their time, even when they know the buyer has waited too long and is about to walk from the deal. There just doesn’t seem to be any sense of urgency or accountability at some of these banks and you get the feeling of indifference from them. Nothing hurts a business more than indifference. A customer can receive bad service, but as long as they feel like somebody cares they’ll still repeat. When a customer feels like nobody cares, bad service is remembered and even talked about. Sometimes I wonder if indifference in tough times will be remembered by customers when the good times flow again and how this will affect these banks business in the future. Each short sale is different though and even though we may be dealing with a bank, there may be an investor on the backend that just doesn’t want to accept less than the full amount owed. You would think by now most of these investors would look at the BPO (Broker Price Opinion), the appraisal, and the payment history of the borrower and realize doing the short sale may be in their best interest. Sometimes we blame the banks, and believe me they deserve much blame, but we must remember that they also may be dealing with an investor and they’re just the middle man. It’s always easy to blame the middle man, but a little communication would go a long way in a tenuous process. Short sales can also be complicated when there are liens on the property such as utility, or homeowners associations, property taxes, or even unpaid workers who worked on the property. Adding to the complexity is when we have to deal with multiple loans or home equity lines of credit, PMI companies, etc. The short sale process isn’t easy for amateurs. While it is complex, we do salute the lenders who are taking it seriously and utilizing today’s technology to facilitate communication and expediency. It will be nice one day when we never have to do a short sale. Until then, it is the new normal so we might as well master the process, and that includes agents, lenders, appraisers, title companies, lawyers, and everyone involved in an intricate process. SW Florida home sale prices in Lee County single family home sales shot up another 16.68% over the previous month and were up 17.14% over last April’s figures as reported by the Florida Association of Realtors. Year to date home prices are up 34.35% bucking the national trend. Buyers are astonished to see prices rising like this and inventory is shrinking. It should not come as a big surprise though to readers as we’ve been explaining for months why this would occur. It is simple supply and demand. Demand is still high for affordable homes both from prospective homeowners and investors who can actually cash flow properties right now based upon today’s prices and interest rates. Typically in the housing cycle buyers try to wait until they perceive bottom and then scoop in and buy. Unfortunately you never really know when you’ve seen the bottom until you see it in the rear view mirror. I’m always amazed at the buyers in a hurry after they feel they’ve missed the bottom who low ball properties with one last try to make up for every last penny they were trying to save on the buy. This makes about as much sense as the seller who over-prices his home by 20% just after the market has turned and headed down. Sellers never want to get caught chasing the market down, and buyers don’t want to get caught chasing the market up. Unfortunately we’re seeing buyers chasing the market up and low balling offers only to lose out to another buyer and starting the process all over again. Buyers need to realize they’re not in competition with the seller, they actually in competition with all the other buyers out there. Supply of inventory has shrunk so there is less available property to go around for all the buyers out there. If sales go down later this year it won’t be due to lack of buyers, but rather lack of inventory. We are expecting more foreclosure listings in the future although we’re not expecting a mass dumping of properties here in SW Florida because we believe we’ve seen the lion’s share of the investor properties that flooded the market the past several years. Instead, we believe we’ll see an influx of foreclosures on “Average Joes” who have lost their job or become underemployed due to the poor economy. If our view is correct, and if we don’t see any major wildcards affecting the housing market, prices could maintain a slow pace upward until we see more inventory. Sellers have no competition from builders because there is little building activity at these price points. That will change once prices go higher, but the question is how long will it take to get to that point? The outlook for sellers looks brighter unless you’re looking for a return to 2005 prices which isn’t happening anytime soon. Buyers need to decide if they’re serious and look to buy their 1st choice or their 5th choice. You can educate yourself by reading articles like this or speaking with your Realtor about what’s REALLY going on in your market. If you decide to take this advice, you might just have a chance at that 1st choice. If you’re the type that likes the do-it-yourself home study course, you might be looking down the barrel of your 5th choice. Either way, the market controls your direction and you control when and where you arrive.